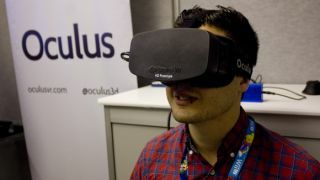 Makers of the exciting Oculus Rift virtual reality gaming headset are more excited by launching the device for use with next-gen mobile games rather than the Xbox One or Sony PS4 consoles. The CEO of Oculus, Brandon Iribe, told Edge the company hopes to launch the device in 2014 with a focus on games for the next Samsung Galaxy and Apple iPhone handsets. While Iribe refused to rule out a console launch completely, he claimed the ongoing innovation in the mobile sector and the ability for users to just plug and play makes it a better option. While dismissing the possibility of a 2013 launch, the CEO said a 2014 launch will only come "if its right," while also pledging to try and keep the costs under $300 (£196, AU$£26). "I love consoles but internally we're a lot more excited about where mobile's going to go, and being able to plug it right into a next gen cellphone," he told the gaming publication. "It's the innovation, and how fast cellphones are now improving – where we'll be with the next Galaxy or the next iPhone compared to where consoles are. Those things are almost doubling every year, compared to a console that's just stuck it out for eight years – it just makes us very excited. "There's a lot of improvements that can be made on the hardware side for VR that no-one's doing yet because it's a new thing. The mobile rate of innovation is going to be able to make a lot of those improvements." Intrigued? Check out our hands-on with the Oculus Rift from the recent E3 gaming show.